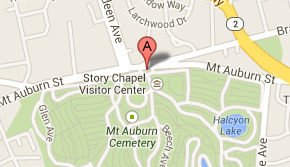 In 1844 Mount Auburn selected the hill overlooking Mount Auburn Street as the location for its chapel. Following a design competition to solicit plans for the building, the Cemetery’s trustees chose the anonymous design submitted by Dr. Jacob Bigelow as its winner. Architect Gridley J. Fox Bryant was commissioned to draw up working plans for the Gothic Revival chapel. It was constructed with Quincy Granite and completed in 1846. The building suffered from many problems, attributed to faulty construction, and in 1853 it was taken down and completely rebuilt. The Chapel was the first major structure, other than the Egyptian Revival Gate, built by the Cemetery and remained its primary building for most of the 19th century. It remains one of the Cemetery’s great architectural features today.